最初是因為以下的 Code 讓我對這個問題有興趣. 這段簡單的程式碼 Matplotlib 以及 NetworkX 來合作畫圖. 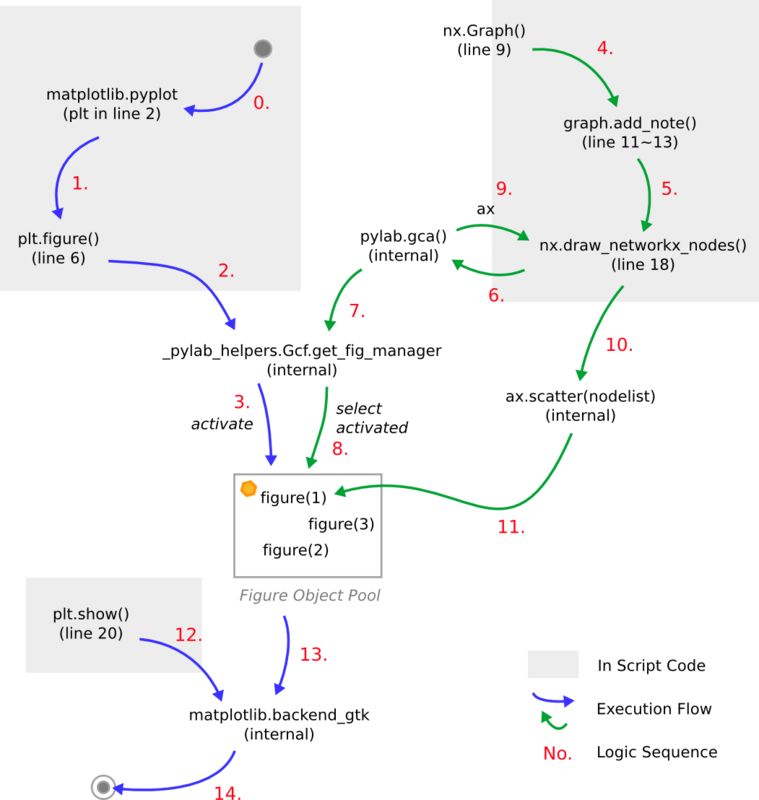 其中 NetworkX 負責 Graph Model 的建立, 而 Matplotlib 則負責 Figure 繪圖的部份. 而我覺得程式碼有趣的地方在於, 細看程式碼, matplotlib.pyplot 只有在 line 6, 以及 line 20 被使用, 期間 line 9 到 line 18 都是 networkx 的運作. 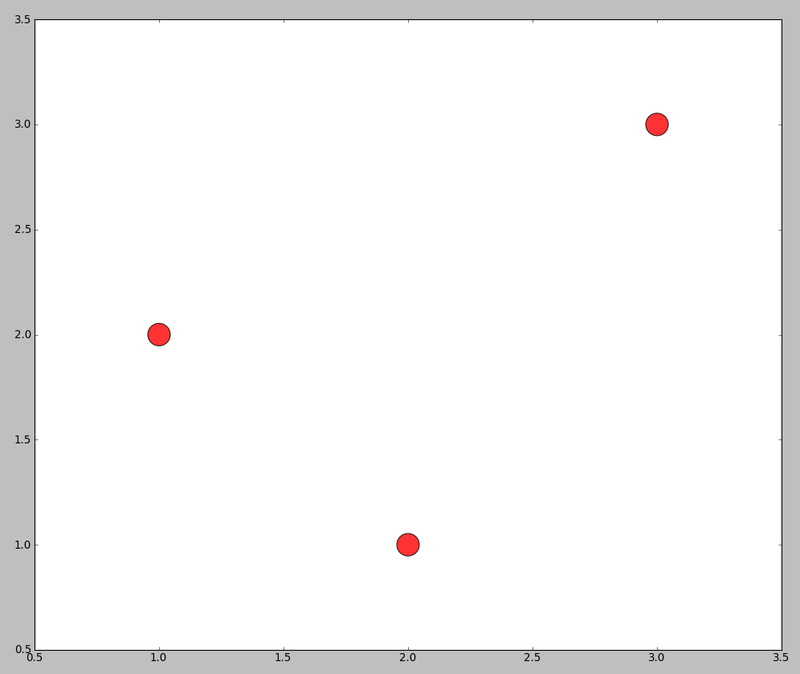 而, 在此 Script 中, networkx 跟 matplotlib.pyplot 表面上是沒有任何互動的, 沒有任何 Message Passing 或是 Object Communication 出現. 如果單單依照此 Script 中的 Program Logic 作 Program Slicing, 或許就會被乾脆地切成兩個 Program Slices 了. 不過想當然爾, 既然最後可以順利地畫出圖來, 這兩部份的程式碼肯定在背後有進行某種 Communication, 否則不可能在 networkx 中建好 Graph Model, 在 matplotlib.pyplot 中就知道要畫出甚麼樣的 Figure. 其中比較關鍵的是 Matplotlib 在 Figure Management 上, 允許同時間有數個 Figure Instances 存在, 而目前要畫在哪個 Figure Instance 上, 則視乎目前哪個 Figure 被設定為 Activated. 在 plt.figure() 中 ( 事實上為 matplotlib.pyplot.figure() ), 可以透過參數 num ( 可參考 Online Document, 即 Figure Instance Identity ) 指定要 activate 那一個 Figure Instance, 如果 Instance 不存在, 則會產生一個新的 Instance. 而在綠色的流程中 ( 即程式碼 line 9 到 line 18 ), networkx 在 nx.draw_networkx_nodes 進行中會透過 matplotlib.pylab.gca 取得目前為 Activated 的 Figure Instance 其 ax object ( 座標軸物件 ), 之後透過 ax 把要畫出來的 nodes 加進去. 最後 plt.show() 透過 matplotlib.backend_gtk 把圖畫出來. 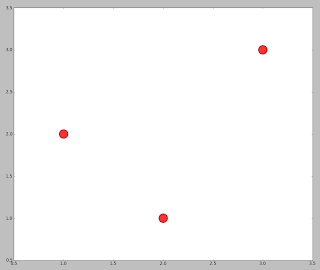 這 Matplotlib 中的 Figure Instance 取用機制大體上是為什麼原本的 Code Script 中, 在乍看之下 networkx 跟 matplotlib.pyplot 沒有 Communication, 但是還是可以把圖畫出來的主要原因. This entry was posted on 下午11:17 and is filed under open source , python , Software Tool , visualization . You can follow any responses to this entry through the RSS 2.0 feed. You can leave a response, or trackback from your own site.